Average dairy farm incomes were up due to a boost in the milk price last year. The latest Farm Business Income (FBI) figures, published yesterday by the Scottish Government, show a 19% increase in the average commercial farm income last year to £35,400 – the highest in six years. FBI represents the total income available to all unpaid labour and their capital invested in the business, excluding returns from diversified activities. 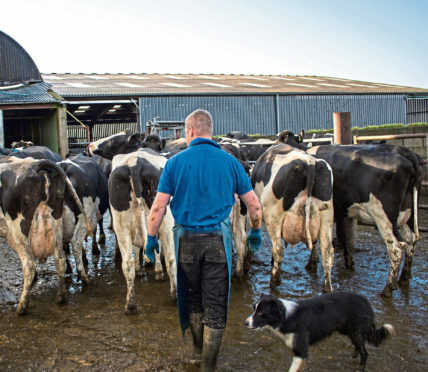 Dairy farms experienced the largest increase of average income at £73,100, driven largely by a 22% increase in the average price of milk to 28p per litre. According to the government’s chief statistician, the farming sector’s reliance on subsidy payments was evident in the figures, with more than 60% of farms surveyed reporting a loss without subsidies. The average business made a loss of £7,400 without support. Beef and sheep farms in Less Favoured Areas were more vulnerable, with an estimated average loss of £27,400 without support. The figures also showed that farms which had expanded beyond traditional agricultural work had incomes that were around £19,600 higher than those that had not diversified. There was an increase in the number of farms – 60% – able to pay the minimum agricultural wage or more to unpaid labour. Rural Economy Secretary Fergus Ewing welcomed the increase in average farm incomes but said the figures masked the stress that many individual producers face due to severe financial pressure and thin margins. “Worth around £500 million a year, the statistics show the importance of continued EU funding to Scotland’s farmers in supporting jobs and sustaining rural businesses,” he added. NFU Scotland director of policy Jonnie Hall said: “Reliance on support payments, together with increasing diversification, are symptomatic of farming enterprises that cannot rely on adequate and stable returns from the marketplace to offset costs that continually creep upwards.